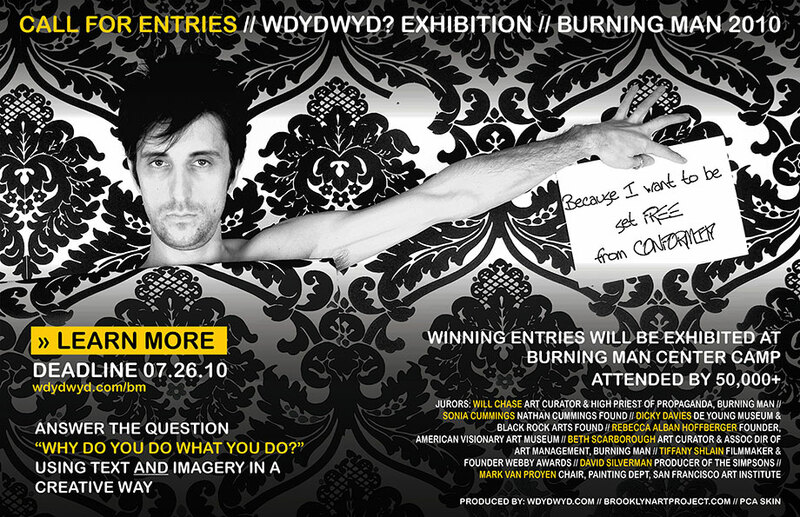 Answer “Why do you do what you do?” by combining text + imagery in a creative way. Subscribe to get curated wdydwyd photos periodically by email. Join the Burning Man Collaborative Artists Group if you want to stay in the loop on the project. Go here if you want to be part of a collaborative photography shoot on the playa this year. Amazing stop-motion animation video by Bill Kennedy. Special thanks to our selection panel this year: Will Chase High Priest of Propaganda, Burning Man & Freelance Art Curator //Sonia Cummings Nathan Cummings Foundation // Dicky Davies de Young Museum & Black Rock Arts Foundation // Rebecca Alban Hoffberger Founder, American Visionary Art Museum // Beth Scarborough Art Curator & Assoc Dir of Art Management, Burning Man // Tiffany Shlain filmmaker & founder Webby Awards // David Silverman producer of The Simpsons // Mark Van Proyen Chair, Painting Dept., San Francisco Art Institute & Corresponding Editor for Art In America.